The episodes ‘Bound in Flesh’ and ‘The Dark One’ also take place at the haunted cabin, so I’m sure all the Ghostbeaters out there got their fill this season. At the start of ‘Bound in Flesh’ was a great moment with Pablo & Kelly trying to tell Ash apart from his evil twin. They are then side-tracked when Pablo & Kelly have to divert hikers away from the cabin, where they are confronted by Amanda who has been reanimated by dark forces. Her scene as a Deadite was likely the funniest moment in the show so far. They are saved from Amanda by Ruby who makes her entrance with a surprising acrobatic stunt. Ruby confronts Ash and insists that the only was to stop the dark forces is by performing a ritual to dismantle the Necronomicon, leading to a big twist in events. Ruby then reveals her true sinister intentions. The episode ‘The Dark One’ begins with the cabin erupting with chaos. Deadite-Amanda seems to be gone from the series after she bursts into the cabin and Ash has to take her out. 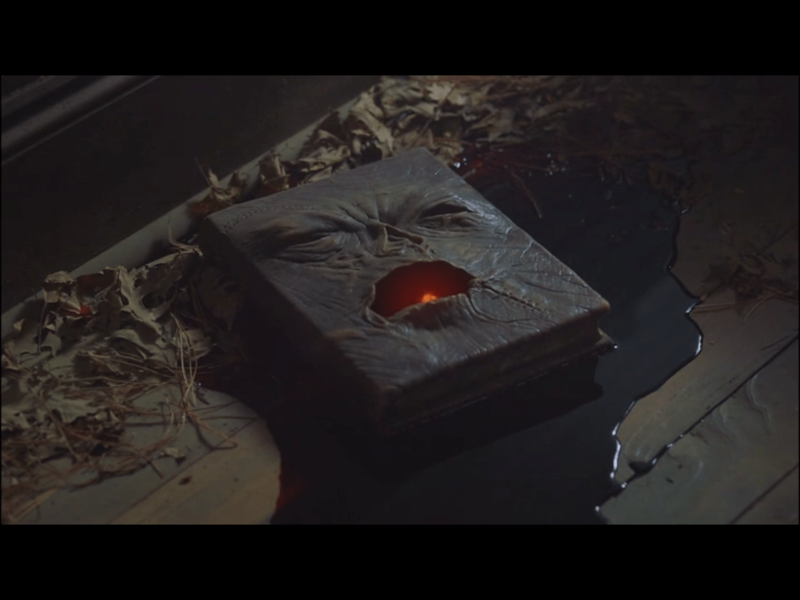 Ruby places Pablo under a spell and escapes into the basement with him and the Necronomicon. Ash and Kelly are determined to rescue Pablo, but the dark forces only allow Ash into the basement. The fruit cellar is just as faithful in design as the rest of the cabin. Ash has a really great moment here, dispatching a Deadite with the boom-stick and providing his best one-liner this season. He finds Ruby in the back room, forcing Pablo to help her summon creatures from the Necronomicon. Ash initially seems to get the upper-hand, but with Pablo & Kelly’s lives at steak, he agrees to a compromise with Ruby. The season soon ends here. I won’t spoil the ending, but I will say that Ash certainly has his priorities in mind when he asks Ruby to include gas money in addition to their deal. The first season gave me just what I wanted to see from this series. I can’t think of any jokes that didn’t hit their mark, even their groaningly lame group name, ‘The Ghostbeaters’, has grown to please fans. The creepy moments are genuinely effective and serve well to establish the horror elements. I’m still in disbelief that this show was made, if it had to stop right here I’d still be happy with what i got, because I had to see the show to believe it was for real. 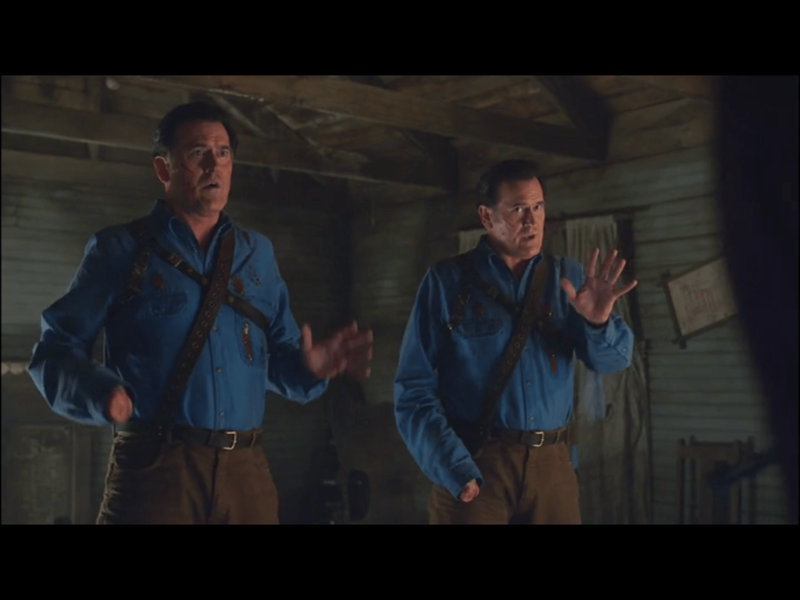 Bruce Campbell is immensely entertaining, I love the mystery that continues to surround the Necronomicon and the great humour you could only get from Bruce Campbell and The Evil Dead together. My reviews are pretty low on spoilers, so I hope some of you decide to check it out & enjoy. Hail to the king, baby!